Sarah Sze: Triple Point, the official U.S. representation at the 55th International Art Exhibition – la Biennale di Venezia, is organized by The Bronx Museum of the Arts and is presented by the Bureau of Educational and Cultural Affairs of the U.S. Department of State. The exhibition is produced with the collaboration of the Peggy Guggenheim Collection, Venice (Solomon R. Guggenheim Foundation, New York). Lead foundation support has been provided by the Ford Foundation, with additional support from the JL Foundation, Charina Endowment Fund, Bobbie Foshay, Agnes Gund, The Ronald and Jo Carole Lauder Foundation, The O’Grady Foundation, Laurie M. Tisch Illumination Fund, Gwen and Peter Norton, The Isambard Kingdom Brunel Society of North America, Cynthia Sears and Frank Buxton, Nancy and Stanley Singer, Martin and Rebecca Eisenberg, The Ahmanson Foundation, The Broad Art Foundation, Stefan Edlis and Gael Neeson, Charlotte and William Ford, Suzanne and David Johnson, The Mohn Family Foundation, Melissa and Robert Soros, Toby D. Lewis Philanthropic Fund, Words of the World Fund, Jennifer McSweeney, Willow Bay and Robert A. Iger, Sue and Joseph Berland, Columbia University School of the Arts, Alison and John Ferring, The Kwon Family Foundation, Sarah Peter, The Pollock-Krasner Foundation, Inc., Altour, Melva Bucksbaum and Raymond Learsy, Joanne Cohen, Ellyn and Saul Dennison, Joel and Zoë Dictrow, Mandy and Cliff Einstein, Joanne Gold and Andrew Stern, Vicky Hughes and John Smith, MiYoung Lee and Neil Simpkins, Cynthia H. Polsky, The Poses Family Foundation, Cindy and Howard Rachofsky, Jeanne Greenberg and Nicolas S. Roahtyn, Allegrini, Castello di Roncade, Nardini Distillery, Podernuovo a Palazzone di Paolo e Giovannni Bulgari, Solé Water, and individuals. Special support of digital engagement and education programs is provided by Bloomberg. 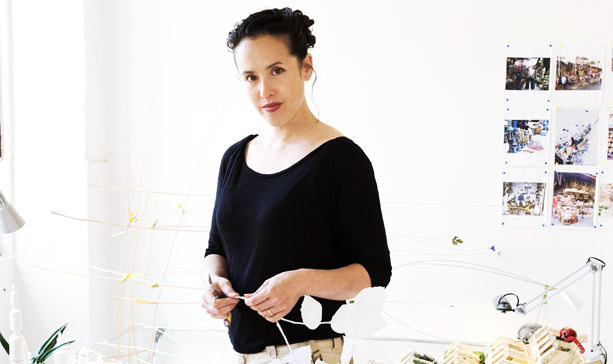 Sarah Sze has exhibited at the Solomon R. Guggenheim Museum, New York; Serpentine Gallery, London; Museum of Modern Art, New York; Museum of Contemporary Art, Tokyo; High Museum of Art, Atlanta; and the San Francisco Museum of Modern Art. Sze’s work has been featured in solo exhibitions at the Institute of Contemporary Art, London; Museum of Contemporary Art, Chicago; Whitney Museum of American Art, New York; Walker Art Center, Minneapolis; Malmo Könsthall, Sweden; Asia Society, New York; and the Cartier Foundation, Paris. Her work has also been featured internationally at the 48th International Art Exhibition – la Biennale di Venezia, 10th Biennale de Lyon, 5th Liverpool Biennial, 25th São Paulo Biennial, 1st Berlin Biennial, the 2000 Whitney Biennial, and the 1999 Carnegie International. She has also received critical acclaim for public commissions at New York City’s High Line; Massachusetts Institute of Technology, Cambridge; and the Public Art Fund, New York. Born in Boston in 1969, Sze received a BA from Yale University in 1991 and an MFA from the School of Visual Arts in 1997. She is a 2003 MacArthur Fellow. The Heydar Aliyev Foundation is the largest non-governmental organization in Azerbaijan; it was established in 2004 and since then it implements large-scale programs and projects both in the country and abroad. The main goal of the Foundation is safeguarding national and spiritual values, wide promotion of Azerbaijani culture, implementation of various programs and projects ensuring the development of science, education, healthcare and social sphere, as well as promoting the international image of the country worldwide. 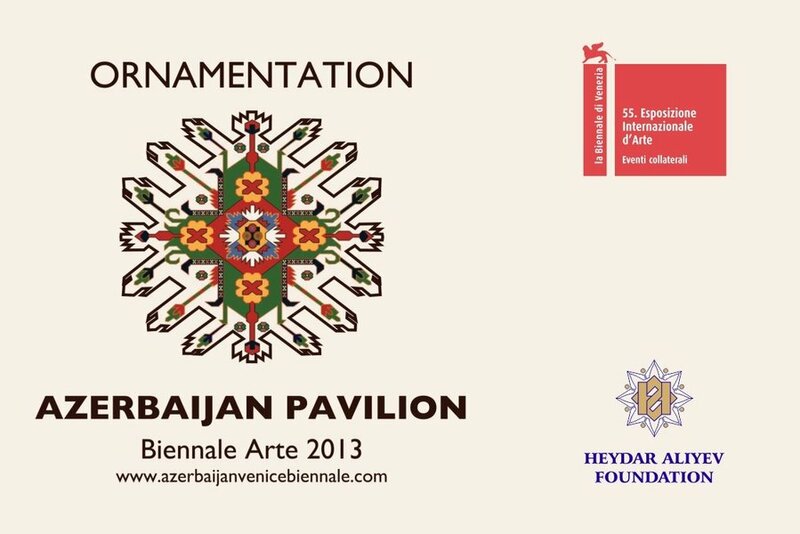 Hervé Mikaeloff was appointed curator of the Azerbaijan Pavilion and has selected the six artists Rashad Alakbarov, Fakhriyya Mammadova, Butunay Hagverdiyev, Sanan Aleskerov, Farid Rasulov and CHINGIZ to represent Azerbaijan at the 55thInternational Art Exhibition – la Biennale di Venezia. The concept of the exhibition, proposed by the curator Hervé Mikaeloff is to show the great importance of tradition and rich ornamental culture of Azerbaijan, with its rootsdating back to the thick of the centuries and today continuing its life in the works of modern art. According to curator: “In Azerbaijan, daily life represents a constant source of inspiration for creation especially through decorative arts. 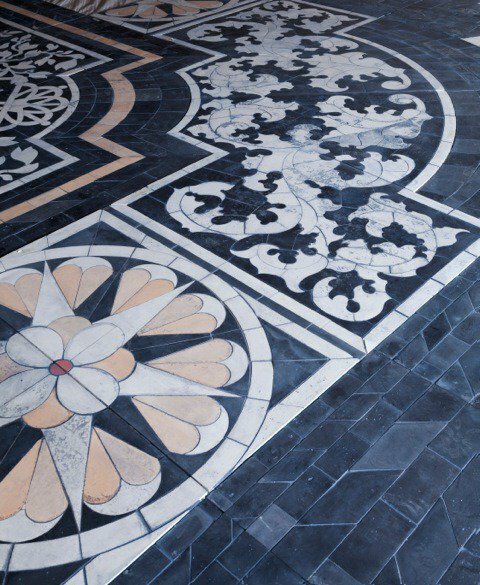 Since modern art, artists have used ornamentation and decorative patterns to fuel their research of surface, space and new forms. Nowadays, a new generation explores and updates this traditional art through a contemporary vision, raising the essence of ornament in relation with the perception of the national cultural heritage as a major artistic question. For this pavilion, six artists interpret their country great ornamentallegacy by using different mediums and perspectives”. Farid Rasulov explores the decoration through the notion of space. He uses carpets as a sort of ready made to show a duality between modern design and oriental atmosphere. Rashad Alakbarov creates unexpected shadows through complex installations. Some objects exposed to a light source cast shadows of traditional decorations called shebeke. Butunay Hagverdiyev paints letters but instead of using words to communicate, he creates an abstract image composed of letters. Some events are described oppositely by different sources. Chingiz erases history and write it all over again by using symbols of the twentieth century on a blank me­dium. Fakhriyya Mammadova followed and photographed a young bride during her wedding. The spectator observes, as a guest, the different steps of his important traditional ceremony. Sanan Aleskerov is well-known for his observation of changes in cities and landscapes. His polaroid series shows a really personal vision of ornaments and landscapes in his country. Commissioners: Apisai Ielemia, Minister of Foreign Affairs, Tapugao Falefou, Permanent Secretary of Foreign Affairs, Tourism, Environment & Labour. The tiny island of Tuvalu located in South Pacific, the smallest member of Commonwealth of Nations, will take place in the prestigious Biennale Arte 2013 from 1st June-24th November for the first time this year. Taiwanese artist Vincent J.F. Huang will create artworks that allow audiences to consider the global climate change issues we face today. A series of ‘black humor’ installations will be on display, namely a colossal oil pump installation, which will transform into a killing machine that will slaughter natural species; a live coral reef aquarium with the remnants of human civilisation submerged within it and an unusual spectacle of animal ‘refugee’ sculptures that have become endangered by global warming. The Tuvalu Pavilion titled ‘Destiny．Intertwined’ serves as a metaphor for the Developed World and Third World and how ultimately as humans, we all end up with the same fate. The 6 metre high interactive oil pump installation ‘In the Name of Civilization’ will be situated at the Forte Marghera-a symbolic fortress dating back to the Napoleon period which was built for the protection of the city of Venice. The installation invites audiences to ‘fill up gas’ whilst contemplating the dying iconic New York ‘Wall Street Bull’-hanging from its noose above it, and the sea turtle, hopelessly waiting to be decapitated. Huang uses these ‘animal victims’ to point out that, under capitalism’s unlimited pursuit of economic development, Earth’s natural resources have been plundered, leading to effects that will not only devastate the ecosystem of a Third World Country such as Tuvalu, but will bring inevitable disasters to the capitalist driven economy of the First World too. The prestigious Venice Arts Academy will be partnering with the Tuvalu Pavilion this year and will house Huang’s artworks and sculptures. Through the collaboration, the Director of the Venice Arts Academy, Carlo Di Raco, hopes to inspire young artists in the academy to reflect on the circumstances within their very own city. The MOSE project in Venice, designed to protect the city from flooding and stop the every-increasing danger and damages from natural disasters shares similarities with Huang’s work and his unique presentation of the Tuvalu perspective. 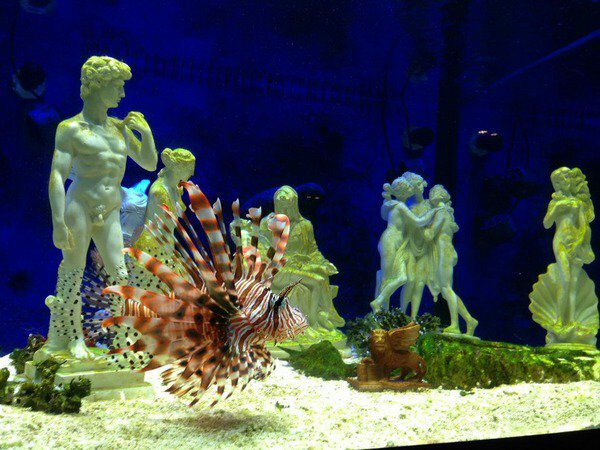 The ‘Modern Atlantis Project’ uses an aquarium tank to house coral reefs which are growing on the surface of the water. Miniature sculptures of iconic landmarks represent the civilised and capitalist society that are now found submerged within the tank. The corals are free to flourish until the resources in the aquarium are fully consumed, leading to a coral bleaching event. By re-creating a modern day Atlantis city, Huang shows- all that is known to civilized mankind will one day be flooded by rising sea levels and human’s unrelentingly desire for infinite growth will inevitably lead to the extinction of our one Earth. The final artwork ‘Prisoner’s Dilemma’ considers the dwindling natural resources of Earth and the notion that mankind will soon face apocalypse- even the grandiose ‘Statue of Liberty’ falls to her kneels and prostates, in front of portraits of deceased terracotta penguins, in utter remorse. Huang calls the USA to ‘account’ for ‘policing’ the world, yet rejecting to commit equal action on climate change. The artwork is a severe warning to audiences that animals such as penguins will one day become committed to funerals as sacrifices- if mankind continues to plunder nature out of greed. Bill Culbert has been commissioned by Creative New Zealand Arts Council of New Zealand, Toi Aotearoa to exhibit at the 55th International Art Exhibition of la Biennale di Venezia. Culbert will show site-specific works for the New Zealand Pavilion at the Istituto Santa Maria della Pietà (La Pietà). The lagoon-facing venue offers five exhibition spaces, including an outdoor courtyard and a spacious corridor where Vivaldi once taught violin. For the first time the main entrance will be on the Riva degli Schiavoni. Culbert (b. 1935) is a pioneer of the use of electric light in art, making works that harness the qualities of this most intangible of mediums from as early as the 1960s. Over a career that spans almost six decades, he has pushed the frontiers of art through a rigorous, inventive and economic use of materials. Light is both medium and subject matter in his sculptures, installations and photographs, the means of mounting a philosophical enquiry into the art object and its materiality. Culbert’s sculptural installations make striking use of found and new materials. 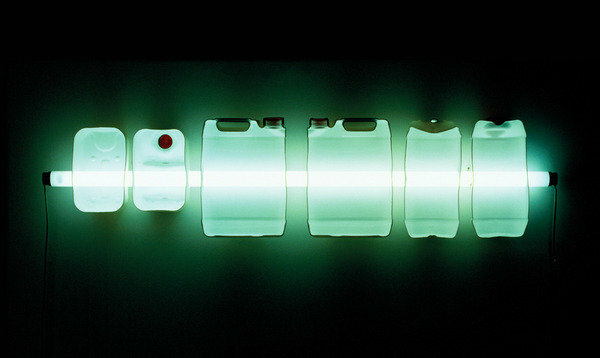 From suitcases pierced with fluorescent tubes, to chandeliers of repurposed furniture, through to arrays of reclaimed plastic containers, his artworks illuminate the qualities of common things and their surrounding environments. Culbert has had more than 100 solo exhibitions since 1960, showing across New Zealand, England, Europe, the United States, and Australia. His work is owned by numerous public and private collections around the globe and can currently be seen in exhibitions at the Château de Servières, Marseilles, France (19 January to 23 February 2013), and in the Hayward Gallery, London’s group exhibition, ‘Light Show’ (30 January – 28 April 2013). Culbert is based in Provence, France and London, England. The curator of New Zealand’s 2013 Venice Biennale exhibition is Justin Paton, senior curator, Christchurch Art Gallery. Paton is one of the country’s foremost curators and an award-winning writer and television presenter on the arts. Culbert started out as a painter, graduating from London’s Royal College of Art in 1960 and soon after exhibiting in the UK’s most prestigious galleries and museums. Gradually the marks in his canvases became apertures, opening his painting into three dimensionality, and by 1968 Culbert had begun began experimenting with electric light, using shadows, camera obscura, photography and fluorescence as media. New Zealand’s arts development agency, Creative New Zealand, funds and administers New Zealand’s presence at the Venice Biennale. Creative New Zealand acknowledges the support of Christchurch Art Gallery and Massey University in the realisation of the 2013 exhibition. New Zealand has exhibited at the Venice Biennale since 2001 with exhibitions by Peter Robinson and Jacqueline Fraser (2001), Michael Stevenson (2003), et al. (2005), Judy Millar and Francis Upritchard (2009), and Michael Parekowhai (2011). 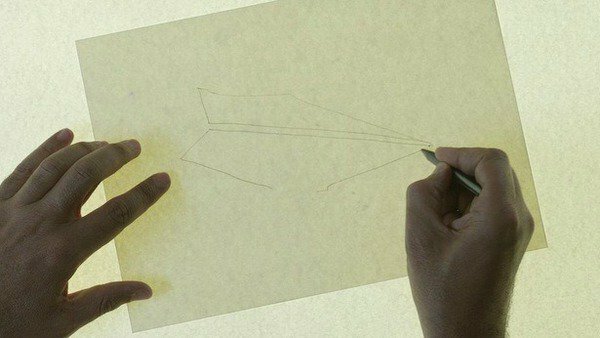 Akram Zaatari will be presenting a major new work, titled Letter to a Refusing Pilot, in the Lebanese Pavilion at the 55th International Art Exhibition – La Biennale di Venezia. Curated by Sam Bardaouil and Till Fellrath, the exhibition marks the debut of Zaatari’s most aesthetically ambitious and politically nuanced project to date, and creates a dialogue between two works, a new 45-minute video and a looping 16mm film, in an immersive environment conceived as a stage awaiting an actor, or a cinema awaiting a spectator. In the summer of 1982, a rumor made the rounds of a small city in South Lebanon, which was under Israeli occupation at the time. It was said that a fighter pilot in the Israeli air force had been ordered to bomb a target on the outskirts of Saida, but knowing the building was a school, he refused to destroy it. Instead of carrying out his commanders’ orders, the pilot veered off course and dropped his bombs in the sea. It was said that he knew the school because he had been a student there, because his family had lived in the city for generations, because he was born into Saida’s Jewish community before it disappeared. As a boy, Akram Zaatari grew up hearing ever more elaborate versions of this story, as his father had been the director of the school for twenty years. Decades later, Zaatari discovered it wasn’t a rumor. The pilot was real. Akram Zaatari is an artist whose work is tied to collecting and exploring photographic practices in the making of social codes and aesthetic forms. Regarding the present through a wealth of photographic records from the past, Zaatari co-founded the Beirut-based Arab Image Foundation in 1997, and he has been working on the extensive archive of Hashem el Madani’s Studio Shehrazade, in the Lebanese port city of Saida, since 1999. The author of more than 40 films and videos—including The End of Time (2013), Tomorrow Everything Will Be Alright (2010), Nature Morte (2008), In This House (2005), This Day (2003) and All Is Well on the Border (1997). Zaatari investigates notions of desire, pursuit, resistance, memory, surveillance, the shifting nature of political borders and the production and circulation of images in times of war. His works have been featured in dOCUMENTA (13) (2012), the Istanbul Biennial (2011), and the Venice Biennale (2007), among others, and he has shown his films, videos, photographs and other documents in institutions such as the Centre Pompidou in Paris, Tate Modern in London, Kunstverein and Haus der Kunst in Munich, Le Magasin in Grenoble, MUSAC in Leon, MUAC in Mexico City and Videobrasil in Sao Paulo. Sam Bardaouil and Till Fellrath co-founded Art Reoriented, a multi-disciplinary curatorial platform operating from Munich and New York in 2009. Their past and ongoing exhibition, research and publication projects include collaborations with several museums and cultural institutions such as MoMA in New York, Mathaf in Doha, INHA and IMA in Paris, IVAM in Valencia, the Gwangju Museum of Art and the Today Art Museum in Beijing. Integral to Bardaouil and Fellrath’s practice is the critique of institutionalized exhibition structures. Through their work, they question the way artworks have been appropriated by reductionist narratives and politicized modes of representation. They excavate art historical materials for the purpose of repositioning them in the more dynamic framework of contemporary artistic production. 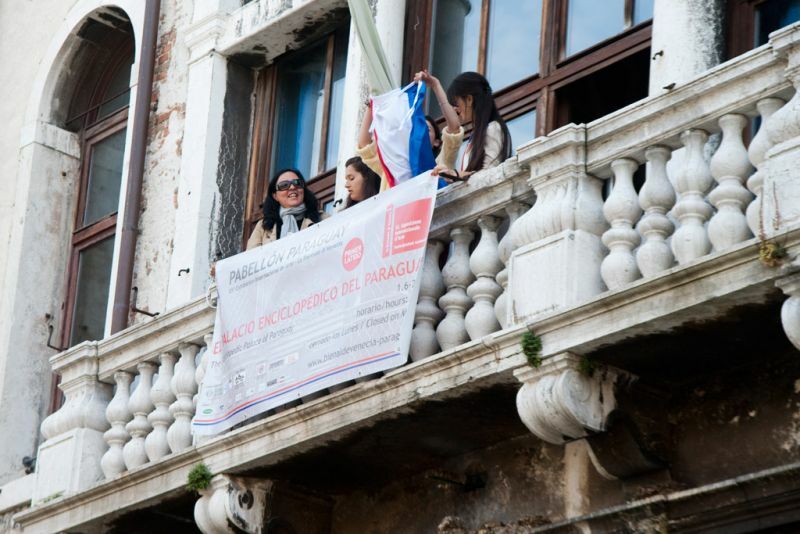 Venue: Palazzo Carminati, Santa Croce 1882 ( San Stae ) , Venice 30135. The Government of Paraguay is taking part in the 55th International Art Exhibition for the fi rst time, and is doing so with works of four P araguayan artists under the title of “The Encyclopedic Palace of Paraguay”. It consists of works from various trends of contemporary art related to the main theme of the 55th International Art Exhibition – La Biennale di Venezia – curated b y Massimiliano Gioni. Pedro Barrail presents his work, “View of Point”, with an intervention in the main room where the paraguayan exhibition will take place. It comes to tackling the virtual space of the canvas with the real space of the room of the Palaz zo Carminati. The internal facade would be erased by its own image, which will have printed in the center a red dot: ” You are not here “. This situation would be the metaphor of Paraguayan cultural isolation and of its wandering in the surrounding world: “a real maze of advertising images and entertainment media‘. The work is inspired by the writings of Jose fi na Pl á . In one of her poems, she spe aks of a “Landscape with no exit ” such as the photographs, an unknown place, inhabited by dreams and silence, while we fl ee to nothingness. The proposal of Daniel Milessi, “Yasururu Sororo” (invasion?) refers to the his tory of successive invaders of Guarani country (now Paraguay) through the Game of War, a video which presents a revisionist conception of history, from colonial days to the present. This game, where nobody wins, is institutionalized: usurers, bankers, and exploiters, supported by the political class in action. Something very important, from an aesthetic point of view, is the discovery by Milessi of the similarity between the design pattern of a native carpet and the videogames in – 8 – bit. Therefore, the visua l communication more suitable for Paraguayans would be: the video – games, part of the pop culture and the popular iconography. In fact the work is a video/animation/performance. Diana Rossi was inspired by a prehistoric fossil, found recently in Paraguay. This is an installation that represents the anteater (“yurumi”) totemic animal of t he indigenous tribe Ache – Guayak í of Paraguay. For them this mammal is considered genitor, sacred ancesto r and icon of the ancient inhabitants of this land. It is made on the basis of “object – trouvé” such as bones, henhouse wires, discarded leather, Coke bottles, etc. The work also recalls the genocide committed against this indigenous tribe in 1973, during t he long Paraguayan dictatorship and conducted by landless peasants and soldiers. The survivors were interned in a kind of concentration camp run by Christian missionaries. The children of the massacred were sold as slaves. The idea of Diana is to pay tribu te to the memory of the disappe ared from the tribe Ache – Guayak í . The work of Felix Toranzos is characterized by a proposal that intends to continue in time, the architectural design, octagonal, called in greek “Horologion”, of the Andronico of Cirro (late first century B.C.) and that appears after 2000 years repeated in the dome of the National Museum of Fine Arts of Asuncion, Paraguay. This Museum has no physical space of its own in the country and is still looking for a final destination. This “Palace of the Winds”, which is also a clock of the elapsed time through history, has been transformed, thanks to the creativity of the artist, in a series of panels, printed with geome tric figures of hermetic renaissance inspiration sealed by the purest Pythagorean tradition, where the geometry and the numbers are divine. The search for lost times is retrieved, in this way, through art. Katrín Sigurdardóttir was born in Reykjavík in 1967 and has lived and worked between Iceland and the United States for 25 years. Since her first solo exhibition in San Francisco in 1992, her works have been shown extensively in Europe and the Americas, and are included in numerous public and private collections. She has had notable solo exhibitions at the Metropolitan Museum of Art, New York (2010); MoMA PS1, New York (2006); FRAC Bourgogne, Dijon, France (2006); Sala Siqueiros, Mexico City (2005); Fondazione Sandretto, Turin, Italy (2004); and The Reykjavík Museum of Art (2004, 2000). Prior to being appointed director of the Icelandic Art Center in March 2010 Dorothée Kirch (b. 1974 – German) worked as a freelance curator and cultural worker. Projects included exhibitions, events and documentaries all in the field of contemporary visual arts. She worked and lived in New York and Berlin before returning to Reykjavik. Kirch graduated with a BA in studio arts from the Iceland Academy of the Arts in 2001 and an MBA (Master of Business Administration) from Reykjavik University in 2005. Ilaria Bonacossa is the Director of Villa Croce, Contemporary Art Museum in Genova since 2012. After ten years as curator at Fondazione Sandretto Re Rebaudengo in Torino, she co-founded Art at Work in 2009: a collective that commissions and develops contemporary art projects through an innovative working platform that operates in both public and private institutions, as well as for-profit and not-for-profit organizations. She has written about art for international institutions and magazines. Mary Ceruti is Executive Director and Chief Curator at SculptureCenter. Located in Long Island City, New York, SculptureCenter is dedicated to experimental and innovative developments in contemporary sculpture. Ceruti has organized numerous solo and group exhibitions, as well as special projects, and commissions by emerging and established artists.